Light-Up Light Suit Samus Costume « Adafruit Industries – Makers, hackers, artists, designers and engineers! Cosplayer Its Raining Neon completed her first Samus suit earlier this year, and she chose to build a Light Suit from Metroid Prime 2. She enjoyed the process so much, she wants to make at least two more of the character’s suits this year (Samus has quite the wardrobe). 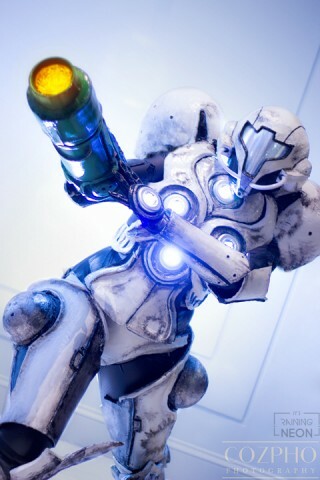 She used craft foam for all the armor, and the whole suit only took her less than a month to make. Besides being her first Samus suit, it’s the first project she’s ever used LEDs on. Both the front and back of the suit are lit. Read more and see more pics at It’s Raining Neon’s Facebook page. Top photo by Cozpho Photography.